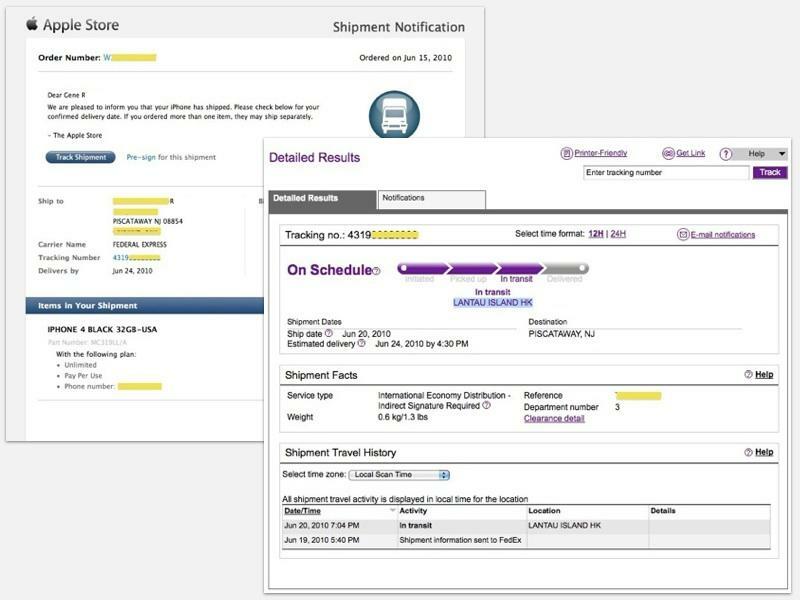 The first batch of iPhone 4 deliveries are now in transit from China, with Apple sending FedEx notifications indicating a June 24 delivery date. Last friday, Apple began marking orders as "prepared for shipment," but now a variety of readers have reported getting iPhone 4 shipment notifications from Apple. Most of the reports indicate a "delivers by" date of June 24, the same day retail store sales begin, although some have said their shipment notifications state a ship by date of June 23. FedEx estimates an arrival time on the delivery date "by 4:30 PM." Apple may request shippers to send items in advance but then hold them for delivery until the launch date, but some readers were shipped iPads a day or two ahead of the planned ship date. Tracking information shows the devices are shipping directly from Lantau Island, Hong Kong, the FedEx shipping site at Hong Kong International Airport.